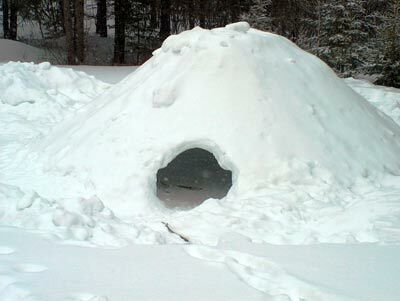 According to dictionary.com, a quinzee is “a hut built out of snow, a combination of an igloo and a snow cave.” It can be spelled either “quinzee” or “quinzhee,” and it’s pronounced “kwin-zee.” It’s basically a shelter made from hollowing out a snow pile. The word itself came from the Athabaskan Native Americans. These quinzees can actually be warmer than a tent if built right! I found a video of a few guys building one of these on YouTube. It’s really cool how big you can make these shelters!